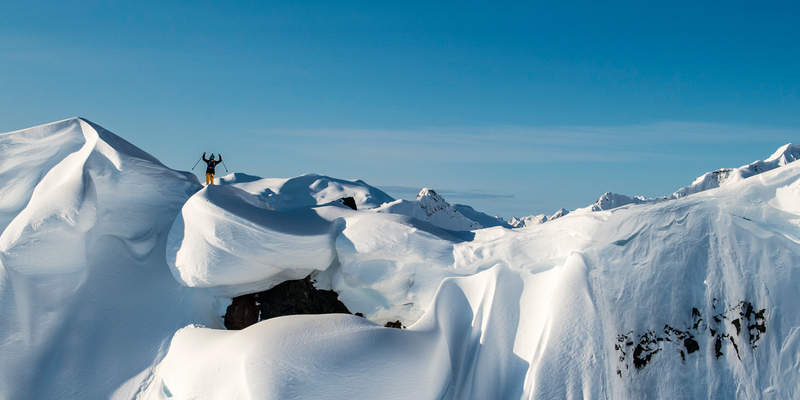 Haines on the Alaskan Chilkat Peninsula is a veritable Mecca for freestyle skiers like Sven Kueenle and Bene Mayr who set up shop here with a film crew and photographer Pally Learmond in order to conquer the Chilkat Range with spectacular runs. Day 1 Yes, we arrived with the Legs of Steel Crew at the Funny Farm, which we already know from our trip two years ago: A hostel, about 30 miles outside of Haines in the middle of nowhere with an address to match – Mosquito Lake Road. Once again, everything is very funny here. We have eight parrots as housemates who really make a racket. Still, the mountains seem different than we remembered them. Very little snow, our guide says so as well. We will have to wait a while before we can start. Luckily, the guys have a few toys laying around, including air rifles and a pool table. Day 9 No entry, because nothing is happening. We wait, wait and wait some more. This is not how we pictured things, but the conditions are simply not improving. The famous "maritime snowpack", the pressed snow that allows you to make perfect lines is completely missing this year. If this continues, the trip is going to be the longest expedition ever. Two days ago, we took the car to Juneau and explored Alaska\\\\'s capital. Bene has already read five books. We exercise a little, but otherwise – booooring! Still, while cruising around, we met an elk by the side of the road. That is something. Day 12 Today, we went out for the first time. It snowed and conditions on the mountain seemed okay. Then came the shocker: on his first run, Bene jumped and triggered an enormous snow slab. Fortunately, he instinctively did the right thing. He remained calm and escaped to more stable ground to the left as the avalanche was going down. We got it all on film. Wow! It looks super intense! Snow is still lousy and we cannot force it, because this is how accidents happen. We have dubbed that place the "Human Bomb", because Bene had the effect of a human avalanche charge. We did it – and get right back up again! Since Sven Kueenle and Bene Mayr had to stay grounded for many days, they ended up with a tight schedule: Up to three extreme downhill runs per day in order to get all the footage they needed! The two of them were not the only ones who had to be in top shape – the guides and helicopter crew had to show their best performance as well. What to do if the ski weather keeps you waiting? Slingshot training for Sven and Bene on the bank of the Chilkat River! The unspoiled natural landscape around the guys base camp created some distractions – even an elk came to visit! Still, everybody was glad when the helicopter was finally ready for take-off after a week of waiting. "One year of preparation. For moments like these." Day 17 At last, after endless down days, there is enough snow and the sky is clear. This morning at 6:30 a.m., we took the helicopter to the Dirty Needle Run – after 8 a.m., the light will be gone again. It was definitely worth it, although we really have to hustle now if we want to get all the takes we need – we had three runs today and took the helicopter up to the Chilkat peaks three times – we are wiped out. But at least something is moving! Day 21 The trip is now taking twice as long as planned, but the last two days went really well and we had some fantastic takes. It is unbelievable that we have been here in Alaska since mid-March! Since we have been rocking an extremely tight schedule in the past few days, we realized once again how important a good helicopter pilot really is. Without his assessments, we would have been lost in so many situations! We will go home soon. It was an intense trip this year – lots of downtime and then action in double time. Cheers!